What do get when you put wheels on a belt sander, mini grinder, circular saw our any other powered hand tool? Well, if you are in Columbus Ohio, you have the Ohio Power Tool Races. The Ohio Power Tool Races are like a grown-up version of the pinewood derby races we participated in as children. All you have to do is figure out how to send a power tool down a 75-foot track as quickly as possible. The races take place next Saturday (9/29) so there is still plenty of time for you to build your entry, or you can show up just to watch. It cost $25 to enter the race, but watching is free. 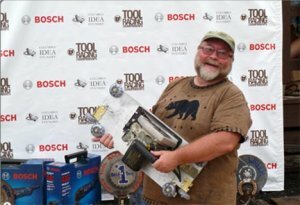 Winners will get trophies, and I hear Bosch will also be throwing in some tool prizes. Head over to Tool Races for more information.